Juliana Carver is the youngest of six children adopted from Russia and Belarus by John and Tammy Carver. Juliana was diagnosed with stage 3 Alveolar Rhabdomyosarcoma on March 7, 2007. She had six weeks of radiation therapy and 14 rounds of chemotherapy. The cancer originated in a muscle in her right forearm. Julie relapsed on March 17, 2011 and received another 12 rounds of chemotherapy and five more weeks of radiation therapy. The cancer originated in a muscle in her right thigh. She relapsed a third time on June 5, 2012 and received 12 more rounds of chemotherapy and ten more weeks of radiation therapy. The cancer was throughout the lymph nodes in her chest and abdomen. Juliana relapsed a fourth time on March 17, 2014, where the cancer was in a small muscle in her right eye orbit. Following surgery that removed 90% of the new tumor, she had five more weeks of radiation therapy and two more rounds of chemotherapy. Juliana relapsed yet again, a fifth time in June 2015, a 6th time in December 2015 and a 7th time in February 2016. Juliana received a bone marrow transplant on April 29, 2016. It was a very difficult several months after the transplant. In September 2016 Juliana relapsed again. She had cancer for the 8th time and lost her battle on October 24, 2016. One of Juliana’s goals was to be a Chef and own a Restaurant. She inspired thousands of people on YouTube and at “Angels for Juliana” on Facebook. Her courage pushes others not to give up. One of her sayings that has touched so many lives is, “I’m not a giver-upper…whining is for babies.” Juliana was fourteen years old and still fighting strong when she passed. In early 2015, Juliana was selected to represent Giant Food as a Triple Winner Ambassador and through this partnership met Chef Robert Irvine. 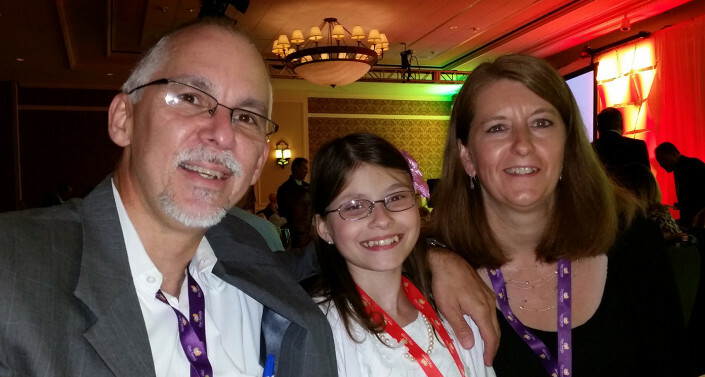 Juliana’s father, John Carver, serves on the Board of Directors of The Children’s Cancer Foundation, Inc. (CCF). John continues to lead by example by helping to bring awareness and attention to pediatric cancer. Click here to see a video about Juliana’s diagnosis.